Carious lesions have different characteristics depending on diverse factors such as host, diet, period of time and injury severity. Controversial results can be observed in the literature of adhesion to caries-affected dentine. While some studies claim that the bond strength obtained in caries affected dentine is similar to the attained in sound tissue (Mobarak et al., 2010; Zanchi et al., 2011; Zawaideh et al., 2011), other researchers detected lower bond strength when adhesives were applied on caries affected dentine (Kunawarote et al., 2011; Marquesan et al., 2009; Perdigao, 2010). Basically, these diverse results can be due to the use of natural carious human molars to compose the sample. Although some studies use artificial caries affected dentine (Zanchi et al., 2011) results are still controversial. Also, using natural carious substrate in experimental studies can induce results with high variability; consequently, they do not allow direct comparison between studies. Bonding to standard artificially obtained caries affected laser irradiated dentine could not be detected in literature. The following figures present the differences observed in caries affected dentin irradiated by distinct types of lasers. Also, a comparison between these surfaces and the sound ones is essential, because adhesive systems were developed to interact with smear layer covered dentine. Fig. 3. Scanning electron micrographs of sound (A ) and carious (B) human dentine. ATypical smear layer image, with clear indication of tubules apertures position by the presence of microcracks, suggesting a thin smear layer; B - Presence of biofilm on dentine surface, areas with exposed open tubules, while other regions are considered free of debris. Original magnification: A = 1000 X; B = 500 X. Fig. 4. 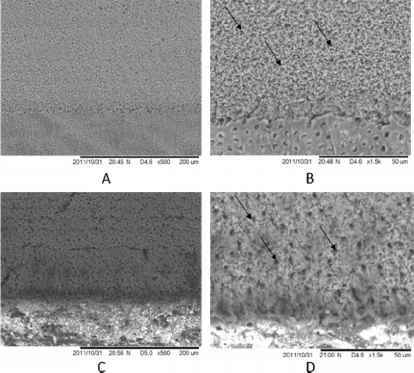 Scanning electron micrographs of sound (A) and carious (B) human dentin after irradiation with Er:YAG laser (X = 2940 nm, pulse width of 400 |i,s, beam diameter of 1 mm, repetition rate of 10 Hz). A - sound dentin. Typical Er:YAG laser ablation where we can see open dentinal tubules in a irregular dentinal surface ; B - when carious dentin is irradiated the surface is absolutely irregular, completely covered by debris and biofilm, indicating that carious tissue remains on the surface. Original magnification: 500 X. Fig. 5. 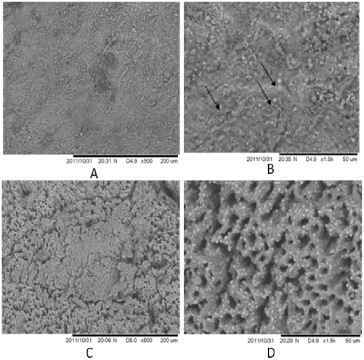 Scanning electron micrographs of sound (A) and carious (B) human dentin after irradiation with a Er,Cr:YSGG laser (X = 2078 nm, pulsed width of 140 |J,s, repetition rate of 20 Hz, beam diameter of 750 ^m). A - As sound dentin is irradiated by Er,Cr:YSGG laser an irregular dentinal surface is created by the ablation process. Dentinal tubules are open and peritubular dentine can be easily detected around all dentinal tubules; B - Carious irradiated dentin still presents open dentinal tubules, but are larger in diameter and filled with debris from the carious tissue. Note that these features are completely distinct from the irradiation by Er:YAG laser. Original magnification: 1000 X. Fig. 6. Scanning electron micrographs of sound (A) and carious (B) human dentin after irradiation with a Nd:YAG laser (X = 1064 nm, pulse width of 100 ^s, repetition rate of 20 Hz, beam diameter of 300 ^s). A - When sound dentin is irradiated by Nd:YAG laser melting and carbonization can be detected covering all the irradiated area, no dentinal tubules can be observed; B - Carious Nd:YAG irradiated dentin also presents melting and carbonization areas, very similar to the sound irradiated dentine. Original magnification: 250 X.
repetition rate of 20 Hz, scanning speed of 2 mm/s, energy per pulse of 280 mJ and energy density of 0.44 J/cm2. During irradiations, the samples were positioned and moved with a linear translation stage with 10 ^m resolution, and it was performed 10 scans. In A, after irradiation on sound dentin, it is possible to evidence fully occlusion of dentinal tubules. In B, a higher magnification of image A, the presence of fine globules and glazed areas (arrows), typical of melting and recrystallization of tissue can be detected. It is not observed the presence of smear layer or any signal of carbonization and cracks. In C a representative image of carious dentin after irradiation is showed, and the presence of an irregular tissue, with some projections of dentinal tubules and absence of biofilm and smear layer is evidenced. It is not observed thermal damages such as cracks or carbonization of tissue. Some areas present dentinal tubules completely opened, while other areas present closed dentinal tubules. In D, a higher magnification of image C, dentinal tubules are completely opened and the presence of small globules on intertubular tissue (arrows), typical of melting and recrystalization are observed. Original magnification: A and C = 500 X; B and D = 1500 X. Fig. 8. Scanning electron micrographs of sound (A and B) and carious (C and D) human dentin after irradiation with a Ti:sapphire laser (Ti:Al2O3, X = 830 nm), operating at pulse width of 40 fs (FWHM), beam diameter of 20 ^m, repetition rate of 100 Hz, scanning speed of 5 mm/s and energy per pulse of 104 mJ. During irradiations, the samples were positioned and moved with a linear translation stage with 10 ^m resolution, and it was performed 10 scans. In A, it is possible to evidence the ablation of sound dentin (upper), with a regular edge with non irradiated dentin (bottom). It is observed a clear and uniform ablation, with absence of cracks, melting or carbonization. As well, it is not observed the presence of projections or conical craters, indicating that the laser interaction with sound dentin is not influenced by the composition or the presence of dentinal tubules. In B, it is showed a higher magnification of the same image, evidencing the ablation of sound dentin (upper), in contrast with non irradiated dentin (bottom). It is also noted the presence of opened dentinal tubules (arrows), and absence of smear layer. In C, it is observed a clear and uniform ablation of carious dentin, with the creation of a regular ablated surface and absence of cracks, melting or carbonization. In D, it is showed a higher magnification of image C, showing that the biofilm was removed and it was exposed the openings of dentinal tubules (arrows). It is also observed the higher depth and the precise edge of ablated area, indicating that it was removed a higher amount of carious tissue when compared to sound dentin irradiation. Original magnification: A and C = 500 X; B and D = 1500 X. Based on the figures presented above, we can conclude that it is fundamental to investigate bond strength to irradiated caries-affected dentine, which is a clinically relevant tissue, as lasers are a contemporaneous tool in daily clinical practice. 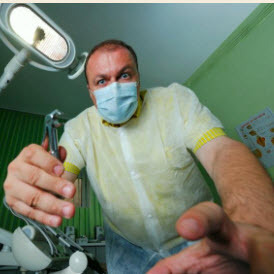 In this way, it is obvious that the performance of the adhesive systems is different when applied in irradiated dentin. To obtain a long lasting clinical result, specific adhesive systems should be developed to be used in irradiated dental surfaces, especially in caries-affected dentine. Methods of inducing artificial caries lesions have been used to standardize the decayed substrate for laboratory testing. Cariology studies using artificial caries lesions have been performed to assess preventive effect of fluoride agents, test methods of caries removal and adhesion on caries affected dentine. Some in vitro caries models have been reported. In the chemical method, the acidified gel technique and pH-cycling method are included; in contrast, microorganism strains with known cariogenicity are used in the microbiological method in a way whereby the acid from bacterial metabolism demineralizes the dental structure (Steiner-Oliveira et al., 2011). More elaborate systems involving chemostats, flowcells, artificial mouths, and constant-depth film fermenter have been developed in an attempt to better mimic the environment of the oral cavity. However, their high cost and complex apparatus requirements are often limiting factors (Gilmour et al., 1990). Some authors believe that the bacterial model is the closest to the conditions found in vivo (Gilmour et al., 1990). The steps of an example of a microbiological method are described, as follows. Initially, the dental specimens need to be sterilized with gamma ray irradiation (25 KGy) since the teeth should be free of microorganisms. A microorganism strain with known cariogenicity, for example, Streptococcus mutans ATCC 25175 or UA159 must be incubated in Tryptic Soy Broth (TSB) media supplemented with 5% sucrose to obtain bacterial growth. After growth, the colonies will be transferred into tubes containing TSB (with 5% sucrose) to initiate microorganism preconditioning. The dental specimen should be immersed in a solution (TSB with 5% sucrose and a quantity of the inoculums broth) and will be maintained therein for at least 7 days, being transferred to a fresh solution every 24 h. During the incubation periods, tests should be performed to check for the presence of bacterial contaminants with the use of a solid culture medium (Tryptic Soy Agar -TSA)(Azevedo et al., 2011). Caries-affected substrate obtained in vitro by the microbiological method significantly contributes to the field of adhesion, because it will allow laboratory tests to be performed on standard caries-affected dentine, which is a clinically relevant substrate. The microbiological method allows the production of artificial caries-affected dentine effectively induced for 7 days and demineralization depth is standardized and it is confirmed by optical coherence tomography (OCT) (Azevedo et al., 2011). Efforts have been made to produce artificial caries-affected dentine and bond strength studies must be conducted, especially in laser irradiated tissues, to associate the use of laser to remove caries and long lasting clinical treatments.